The Columbus Egg donated by Tesla Forum has been used in outreach programs for school kids. 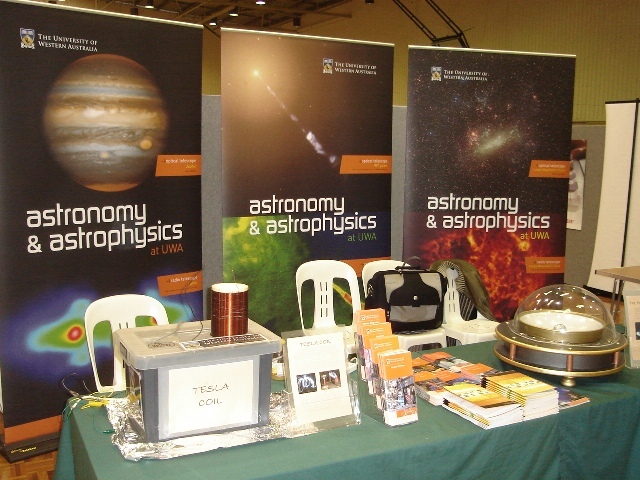 UWA team have been taking the egg display recently to a number of outreach activities, such as the Bunbury Regional Science Awareness Programme attended by a thousand year 10 & 11 students living in the Bunbury area and surroundings (1-2 Sept 2008). The display was also part of the School of Physics Display at ‘Shopping Trolley Science’ which was a 2 day event held at the Carousel Shopping Centre (15-16 August 2008), in conjunction with National Science Week. It was displayed beside a ‘mini-Tesla coil’ designed by Peter Terren (Tesla Forum’s member! ).